I always used to think that I was a little crazy for having such a massive love and appreciation for cupcakes, but now that I'm more of a blog reader, I can see that I'm certainly not the only one! It's strangely comforting to see so many others dedicated to this beautiful and whimsical tiny confection! 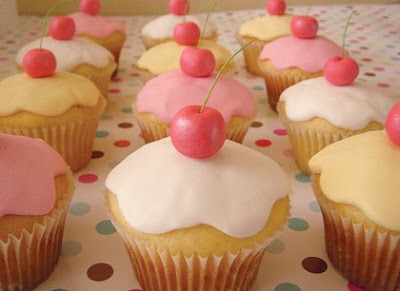 What are your favorite cupcake recipes and decorating tips? I would love to know! I love baking! I have to say my favorite are strawberry or red velvet cupackes. Mmmmm with white frosting. Now I want a cupcake! I find that I am going to get more into it. There are some great recipes on there. I love cupcakes. My daughters and I are always making up new recipes. We have made cupcakes with oreo clouds that have gummy bears on them (think Care Bears). A friend just found me ice cream cone cupcake baking dishes that we are dying to try out. Might have to bake some red velvet cupcakes in them next week! Haha, I'm a box girl too! My secret is to over-beat the batter until it thickens almost like whipped cream. Michelle, I am a HUGE fan of red velvet! It's amazing with creme cheese frosting! And I will have to try that cupcake eating technique! I dont know how to make a yummy cupcake but I do make clay cupcake jewelry.. I love carrot cake cupcakes w/ cream cheese frosting, but honestly I love cupcakes more for the way they look and all the cute things you can find w/ them on it! My husband and I love cupcakes! He's the baker so I'm quite lucky. He uses Magnolia's cupcake recipes. Now I'm craving for some, haha! I don't have any good recipes on hand, but I have a delicious looking cupcake tattoo on my foot! Hello! I also LOVE cupcakes! Many of my etsy are cupcake paper products! My fave trick for moist cupcakes is to slightly underbake them! now---i'll be hungry for these--if i find it, i'll be back! i LOVE cream cheese frosting! thanks for invitation in your blog,it's very nice! I link you on my blog! Because they are little brooches made in felt! :) sorry! I would like to learn to cook edible cupcakes! I'll follow your blog for more Recipes! I will pop back to see what recipes you get though as I'd love to give it a go! Heat oven to 350 degrees. Beat all ingredients on low speed, 30 seconds, scraping bowl. Beat on high speed, 3 minutes, keep scraping the bowl. Pour batter into paper-lined muffin cups, filling each half full. Bake 20 minutes. Frost as desired. Makes 2 1/2 dozen yummy cupcakes. Sprinkles on top always look so cute, and children love them, but just plain chocolate fudge frosting would be great, too. I'm dieting so of course I went for the entry named cupcakes. I found your blog thru my Give...a hand up Blog. Hi, I'm collectionobsession from Etsy. Thanks for the invite! Great blog idea. I love cupcakes, but use a mix. I do bake a 25 degrees less than called for and little longer. They are even moister this way. I just bought a Wilton filling tip and am looking for good filling ideas. LOL, I am way too impatient to decorate my cupcakes, I call them muffins and eat them right out of the oven. So I'm lactose intolerant or lactartded as a friend of mine says. I do love cupcakes though! So I found a really great recipe for vegan Boston Cream Pie...the cake part is awesome! And here it is. Give it a try. I've been told by milk consumers that these guys are amazing. Let me know what you think. Oh and the frosting recipe is based on Sprinkles Cupcakes cream cheese frosting. It's good enough for frosting shots!! Preheat oven to 350 degrees. Sift together dry ingredients and set aside. In a separate bowl add sugar and oil and mix well. I like to do this by hand with a wisk. Next add yogurt and vanilla and mix well. Finally add in the soy milk and again mix well. Gradually add in the flour mixture about 1/3 C at a time making sure it’s not lumpy. Continue adding in the flour mixture until it’s all included. Make sure the batter is well mixed. There should be no lumps. Prepare the cupcake pan with paper liners. This recipe yields over 12 cupcakes so I like to make a small extra cake on the side. That way if I have to give away the cupcakes I still have a bit of cake for myself. Bake cupcakes at 350 degrees for 25-30 minutes. I have found 28 minutes to be perfect in my oven but some oven temperatures vary so always test for doneness with a toothpick or small knife. It should come out clean. Allow cupcakes to cool completely before frosting. Allow the margarine and cream cheese to soften to room temperature. Mix with hand electric mixer to a smooth consistency. Gradually add the powdered sugar a cup a time. Mix thoroughly but try not to over mix. Chill before frosting the cupcakes. I love chocolate muffins with big chunks of white and dark chocolate pieces in them. Yummy! !